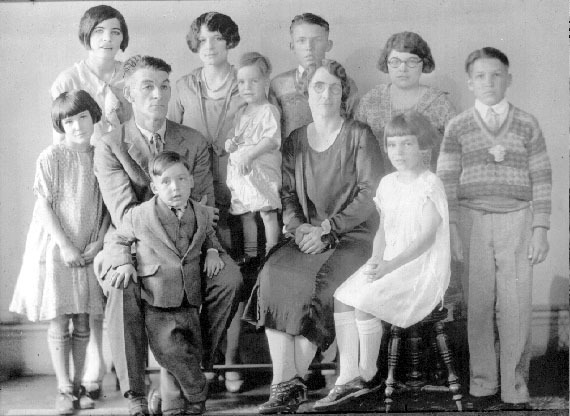 Paul Knox Mitchell married Emma Elizabeth Foster and they had nine children: Wilma, Grace, Hope, Allen, Mark, Esther, Georgia Ruth, Paul Junior and Fred. In 1928 when Wilma died of complications following childbirth, the Mitchell's raised Harriett as their own. In 1920 the family lived in Union County. They moved to Linden then to Harlem Township in Delaware County, Ohio. Fred graduated from Harlem High School in 1941. 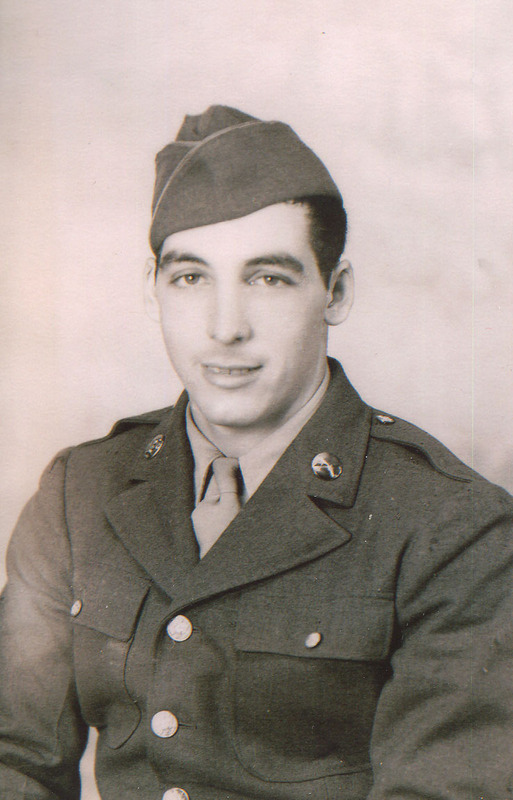 Paul Jr. and Fred served in the U.S. Army during WWII. Their sister Hope was a nurse in the W.A.C. 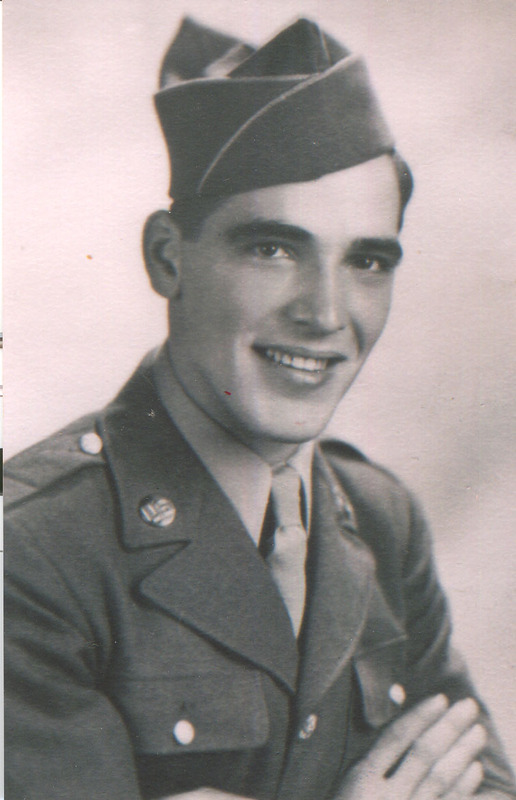 In March 1945, while his brother was in the hospital recovering from frozen toes, Fred was serving in France. On April 19th, Fred captured a German officer at Dortmund, Germany, and took the officer's pistol. Two days later the gun discharged while Fred was cleaning it and killed Fred. He was buried in the American Cemetery in Margraten. Paul and Hope completed their tours of duty and returned home. Later Hope visited her brother's grave in Margarten. 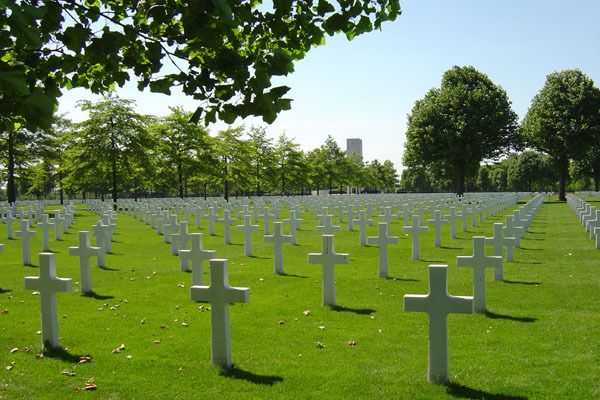 8301 Americans rest at the Margraten war-cemetery close to the city of Maastricht in the southern most part of the Netherlands. The Margraten cemetery is the only American burial ground in the Netherlands, which is no real wonder as it were mostly British and Canadian forces who operated in this section of Western Europe during World War II. The cemetery has an impressive entrance formed by a wide square ("the Court of Honour") with a tall memorial tower at the end of it. Visitors can climb the tower, which provides a clear view over the huge burial grounds behind the Court of Honour. The walls running along the square are engraved with hundreds of names of American Soldiers who went "missing in action" during operations in the surrounding area. The War Museum website has many photos of the cemetery. "You adopt a grave out of respect for the men who gave their lives for our freedom. By adopting a grave these men will not be forgotten, even after 60 years," wrote Nicole Sproncken who wrote inquiring about Mitchell. Nicole explained the adoption process. "At first the adoption register counted all most 18,000 graves, after the repatriation of 1950 it counts 8.301 graves. Since most families of the soldiers are unable to visit the graves regularly the adoptees make sure the soldiers are not forgotten, Actually many families have never been able to make the trip to Margraten. Most of the 8.301 graves on the cemetery in Margraten are adopted. This originates from shortly after the war. The local population felt the need to honour their liberators. They did this by visiting the cemetery and bringing flowers. Often there was contact with the relatives in the USA. In 1946 the civilian committee Margraten was founded. This organization took care of the grave adoptions. It seemed that adoptees moved without giving notice or children took over the grave of their parents without registering this. 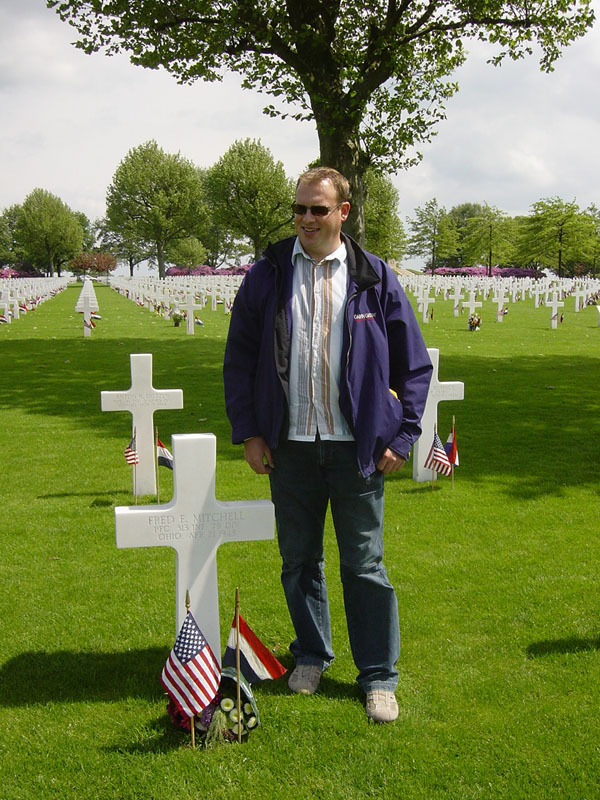 In 2003 the work of the civilian committee Margraten was handed over to a new foundation, the grave adoption foundation American Cemetery Margraten. This foundation started actuating the adoption register. As an adoptee, one regularly visits the grave and brings flowers on special occasions, like Memorial Day, Christmas and birthdays. Having contact with the relatives in the States is a possibility, but you have to find out their addresses yourself and this gets harder and harder with the years passing by." 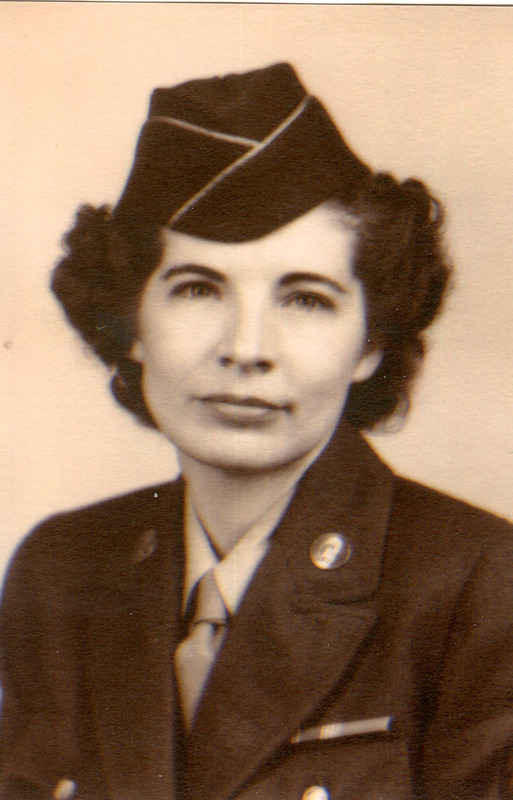 Adoptees are given only name, rank, serial number and unit of the soldier and must learn the rest on their own. 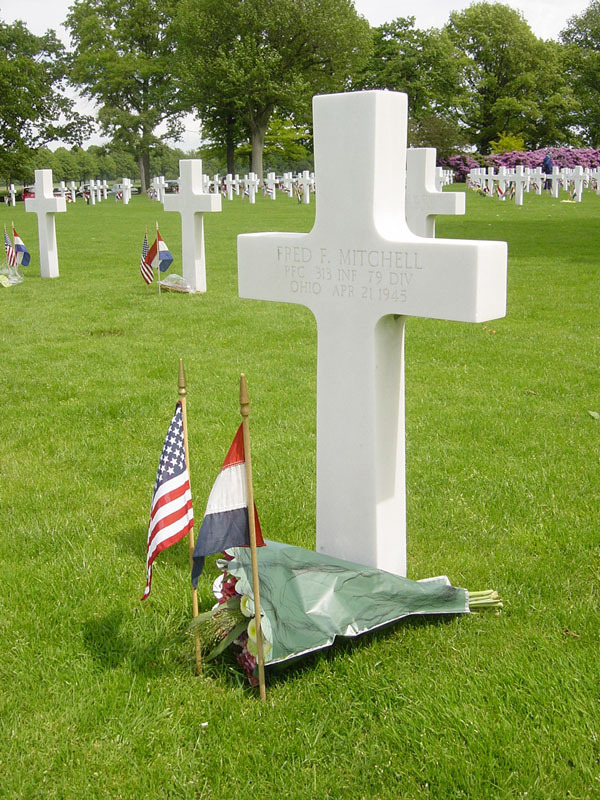 Maurice Schaafstra adopted two graves, one of which is Fred Foster Mitchell's grave. Nicole, who has adopted 3 graves, is helping him contact the families in America to let them know someone cares.